On Friday, the young and young-at-heart headed to New York’s Times Square with one collective mission – to get down with Mickey Mouse! With their dancing shoes on, children, parents and New Yorkers danced their way through the city’s iconic intersection in a surprise flash mob starring the latest, interactive feature plush Mickey Mouse, Master Moves Mickey, from Fisher-Price, Inc. Providing the inspiration for the flash mob choreography, Master Moves Mickey took his music and moves to a whole new level and grooved alongside his biggest fans – children and parents alike – to motivate families everywhere to get up and dance! 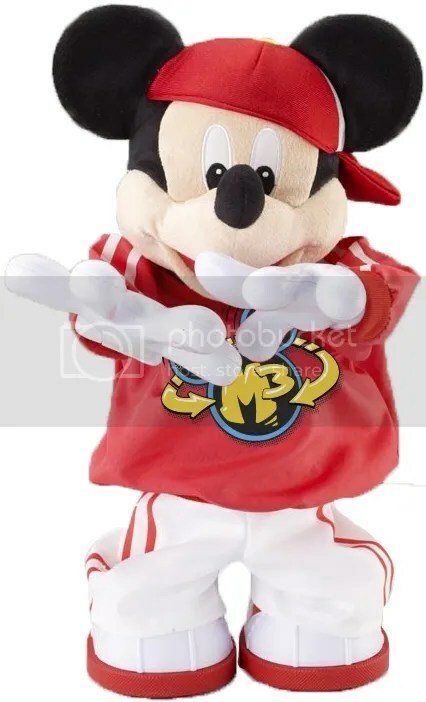 Master Moves Mickey – aka M3™ – is the third iteration of the popular feature plush Mickey Mouse that infuses the original Disney character plush with modern music and moves appealing to the next generation of fans and aspiring dancers. Master Moves Mickey features 15 ultra-cool break dancing moves that are hotter and hipper than ever, including the Windmill, the “Mouska” Mix, the Spin Cycle, the Insane Handstand and the Ham Sandwich, set to original tracks and funky beats. With one press of Mickey’s nose, Master Moves Mickey comes to life for a fun, collaborative dance session. This new Mickey plush gets down to eight different songs with styles like rap, hip-hop and pop all while evoking the humor and endearing personality that has enabled Mickey Mouse to transcend generations. It’s really cute! Master Moves Mickey is available now for $69.99 at retailers nationwide including Toys”R”Us, Target, Walmart and Kmart, as well as Amazon.com and Fisher-Price.com.